UPDATE: See the revision to and discussion of Figure 2. UPDATE: I was so interested in illustrating the differences in the spatial patterns between the models and observations that I inadvertently used correlation maps. If I had I presented the maps of regression against time, I would have been presenting the actual linear trends. 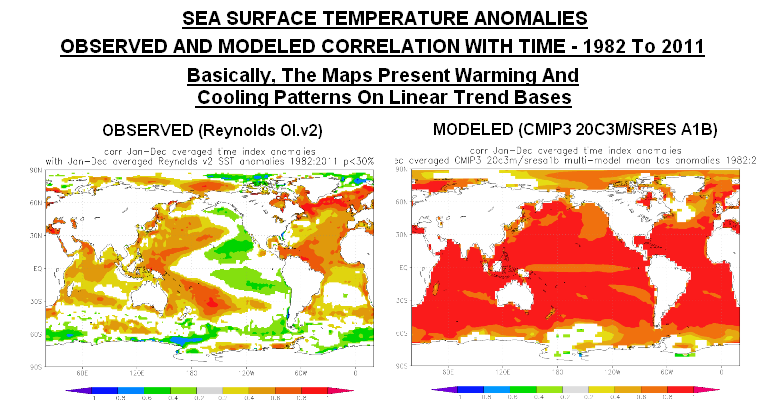 They still show the models do not properly present the spatial patterns for how the oceans warmed (or cooled in the case of the data) over the past 30 years. 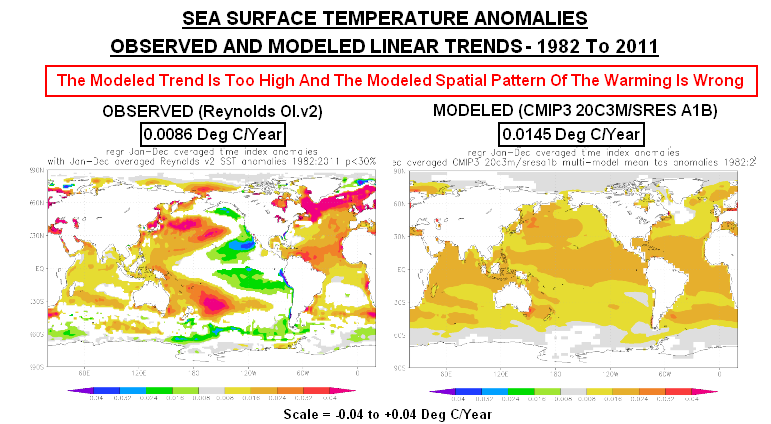 That, of course, will clearly impact any attempts to use models for projecting regional land surface climate on decadal and multidecadal bases, because where the oceans warm or cool dictates regional climate on land. 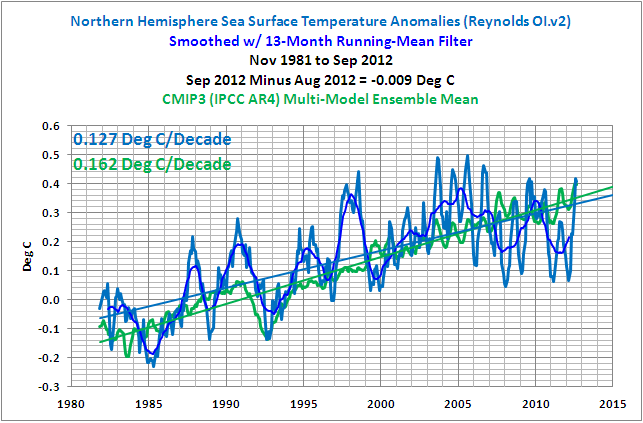 This entry was posted in Model-Data Comparison SST, SST Update. Bookmark the permalink. If nothing else, the Modelers should give you the credit for your independent comparisons and greatly assisting in the ‘development’ of their newer Mods. But for some reason I don’t think that they’re listening/watching anything outside their own ‘Fantasyland’. The differences just at the poles speak terabites about what they thought was going to happen, have you gotten even a hint that they’re adjusting anything, are they still trying to force the world into their square peghole? I referenced your latest piece here and gave the link in a brief comment. Pascvaks: Thanks for the link to Bishop Hill, and thanks for the link there. Thanks, Richard. It’s that last little remaining chunk of Arctic sea ice and the drought that caused the record low temps. You conclude that the process raises the trend some 40%. It would appear that UAH, which doesn’t do the replacing, is actually higher than GISS. The GISS data you linked is marked incorrectly. 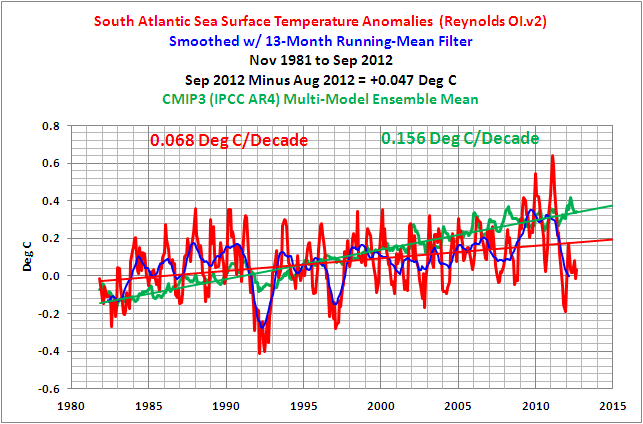 It is SST anomalies, not “Mean Surface Air Temperature over Ocean Areas”. It does not include land air surface temperature data in areas where there is seasonal and permanent sea ice, which is what my post was about. 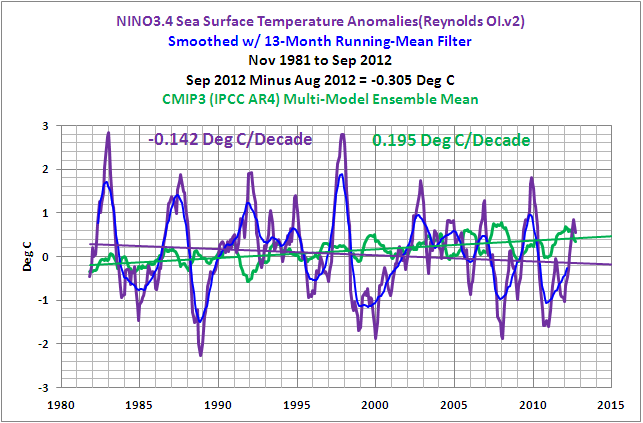 In effect, the GISS data you linked is close to only being sea surface temperature data from 60S-65N. 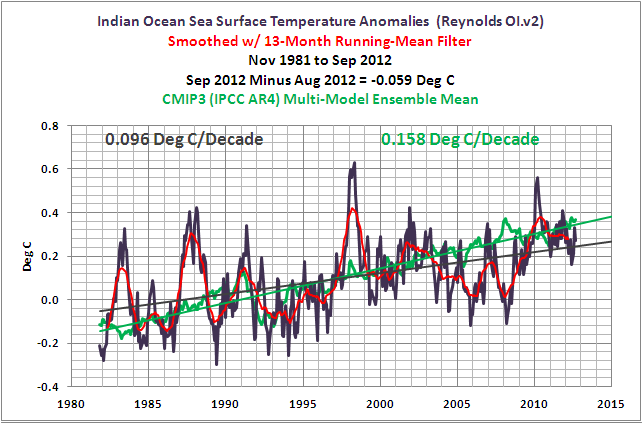 The TLT data over the ocean includes areas with sea ice. It also includes “bleed over” of TLT over land, especially over the Arctic Ocean. 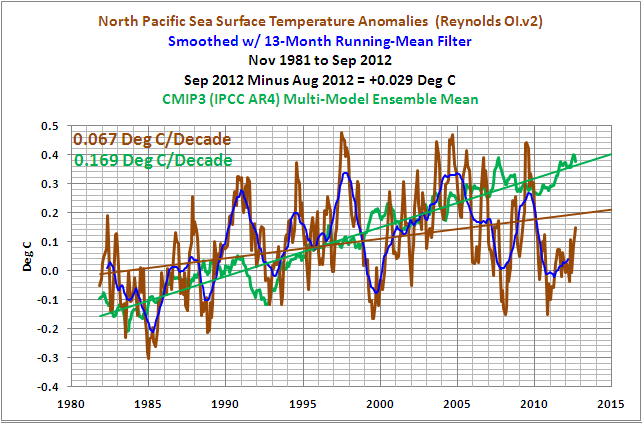 In other words, there’s no way to truly isolate the land and oceans with TLT data. 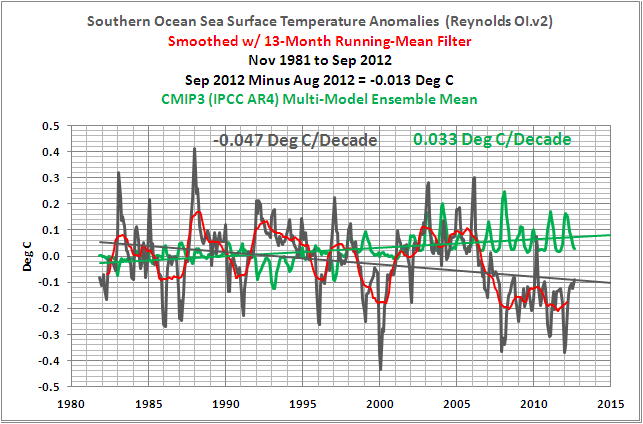 I guess my question was why is the UAH TLT ocean trend 50% greater than the Reynolds SST trend? Is this something to be expected? Is the bleed over that great considering the vast size of the oceans? 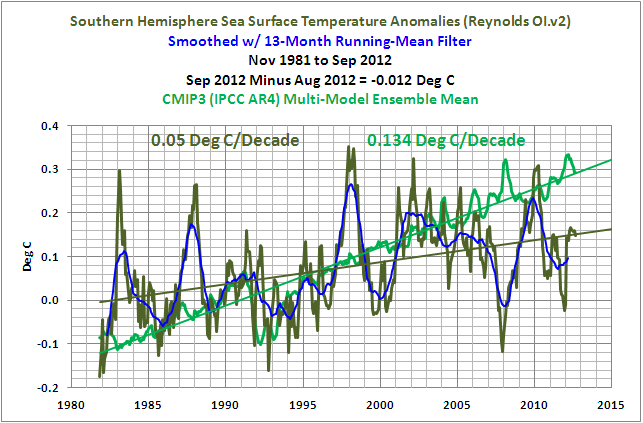 DB: Attached is a gif animation that compares TLT and SST trends from 1982 to 2011. Sorry, the KNMI Climate Explorer won’t allow me to mask the land data for the trend maps. 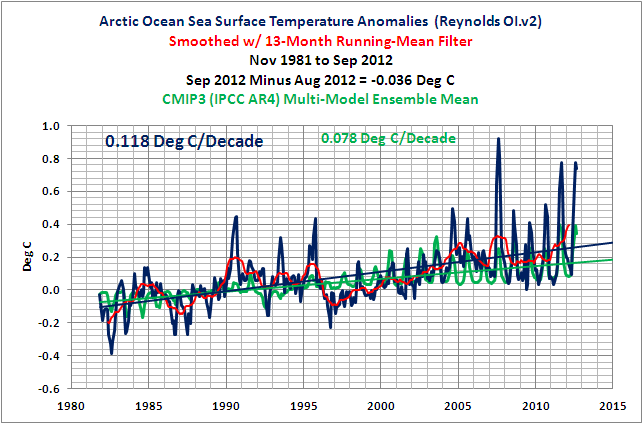 Note how Arctic TLT is exaggerated due to polar amplification. 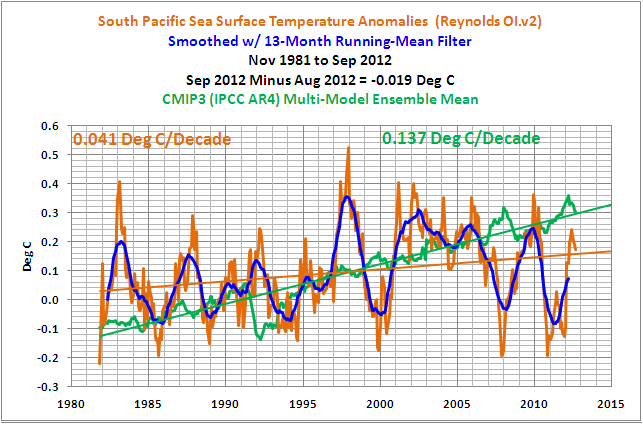 Also keep in mind, TLT exaggerates all variations including the volcano dips and that it responds differently to ENSO than SST. There is a new paper (Nuccitelli et al.) promoted at SkS, which claims that there is no hiatus in OHC during the last decade. 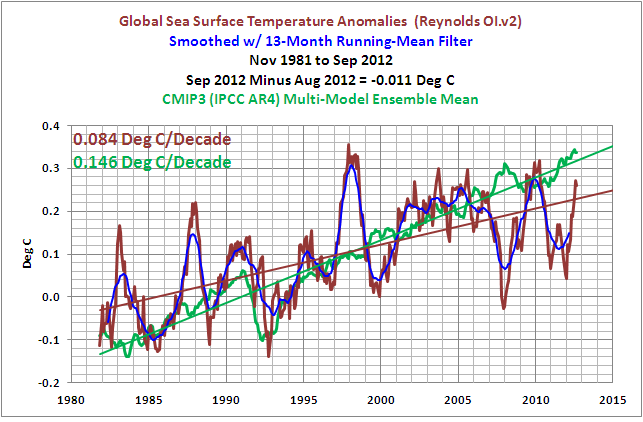 Actually they claim that if anything, it has been accelerating. 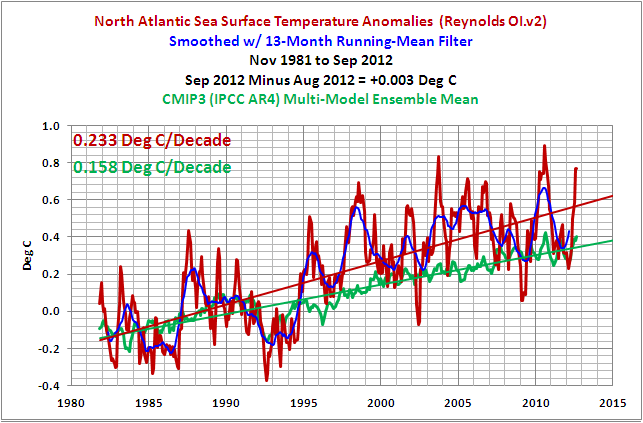 Their data seems bogus to me (comparing to NODC for example), could you dig in to it and perhaps make a post? juakola: I just happen to be working on an OHC post. Though it was not intended as a response to Nuccitelli et al, I started working on it before that SkS post appeared, it should squash their nonsense.